Is it me or is the week after Christmas such a let down??? The week before Christmas is full of excitement filled with parties, presents, shopping, and celebrating and then all of a sudden it is all over just like that. Maybe it is just me? To help us slowly "detox" from all the Christmas celebrating we planned a family fun activity to do each day or night during that week to keep us occupied. It is also a great time for us to just go and do as a family b.c during the "year" we are split up a lot going to practices, church activities, games, parties etc! We truly enjoyed our week of family fun! Tuesday: It was movie night! We split up and saw 2 different movies! 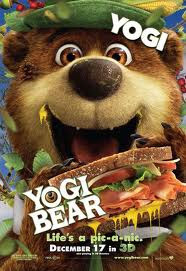 Jackson and Daddy went to see Yogi Bear and Jackson loved it... he said it was so funny! Daddy said he laughed out loud many times! Brylee and I invited GoGo to go see Tangled with us! We loved it!!!!! I think it might be my favorite disney movie. Brylee was a little scared of the "mean mama" but she loved all the other parts... it was such a good movie! Wednesday: We had to go to the doctor because Jackson and Brylee had a terrible cough and low and behold they both had walking pneumonia. We were close to GoGo's office so we met her for lunch and Grandaddy joined us. That was actually one of the things the kids wanted to do during Christmas break. We had a few minutes to waste before we met GoGo for lunch so we took the kids to the Peanut Depot downtown and they were OUT of peanuts.... how can the peanut depot be out of peanuts!!!! So we just had to take a few pictures and head on to meet GoGo! Picture Disclaimer AGAIN... i did not have my "good camera" just my little one in the car so these are NOT that great! :( we will be going back for better ones! We had a great week spending time as a family and doing fun activities together!